Our everyday achievements all add up in eventually reaching our goals. Even simply checking things off of your to-do list can be a big step for you to soon get where you want to be. Take pride in leveling up, and get to do more and be more with a smartphone that looks and feels like a premium device. Go ahead and celebrate, and show that you can jump to your prime with the new Samsung Galaxy J2 Prime. As the latest addition to Samsung’s line-up of quality smartphones, the Galaxy J2 Prime is designed for those who want to treat themselves to a much-needed upgrade, while also keeping in check with great value for money. The Galaxy J2 Prime is the ideal device as you begin your journey to success, capturing the highlights that you would like to share with your family and friends. More than just a smartphone, the Galaxy J2 Prime is an excellent companion on your road to prime with features that suit your needs. Samsung brings in the Galaxy J2 Prime as a premium choice for those looking for an upgrade, while staying smart within a budget. It comes with an 8MP+5MP camera with front flash so you can better capture your daily milestones — whether it’s about trying out that restaurant you’ve been dying to go to, or about the new outfit you got — that you can easily share on social media. Thanks to the front flash, you’re always looking bright and photo-ready at any time of the day. It also boasts of a large 5” qHD TFT screen that allows you to easily view your top picks, so you can fully enjoy browsing through your favorite social media sites, watching your must-not-miss shows, or playing games. Built to withstand the demands of daily life, the Galaxy J2 Prime is equipped with a 2,600mAH battery and an Ultra-Power Saving feature to ensure no down time as you go through your day. The Galaxy J2 Prime’s LTE Cat.4 capability ensures fast internet browsing so that your friends will quickly know the highlights of your day, such as that fun moment at the office, or your bonding time with the family. 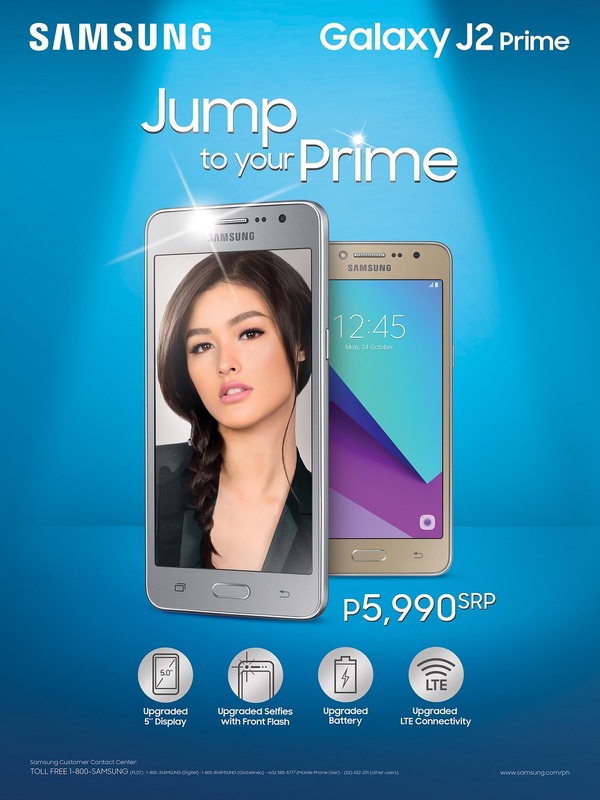 Priced at a reasonable P5,990 SRP, you can go ahead and easily jump to your prime with the Samsung Galaxy J2 Prime! It will be available in Samsung Experience Stores and authorized Samsung dealers starting February 18, 2017. Curious to learn more? Visit https://www.samsung.com/ph/smartphones/galaxy-j2-prime-lte/SM-G532GZDDXTC/ to find out all the premium features of the Galaxy J2 Prime.